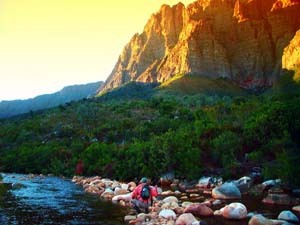 The Smalblaar is probably the most popular river in the Western Cape due to its easy access and fantastic fishing. It flows alongside the Du Toit’s Kloof pass section of the N1 yet once you are on the river you can neither hear nor see the traffic. 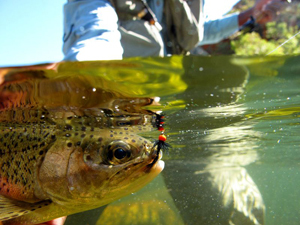 At the end of spring, the Smalblaar attains a certain charisma that distinguishes it from most other trout streams in the Cape. The large pools flow emerald green and heavy Leptophlebid and Baetis mayfly hatches saturate the air. This gets the trout moving and tough nymph-fishing turns into testy dry-fly splendour. The Smalblaar holds a good head of fair-sized rainbow trout, which breed well and thus have not been stocked for many years. The Smalblaar is known to produce some of the larger fish in the CPS waters, with trophy fish of three pounds still being caught every year. 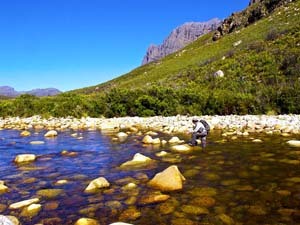 Access to the stream for fishing purposes is controlled jointly by the Cape Piscatorial Society and Cape Nature Conservation, who manage the Limietberg reserve through which the river flows. Fishing is strictly controlled and must be booked in advance with the CPS. Day permits are available to both members and non members, while members benefit from season permits which allow them more frequent access to this beautiful stream. The Smalblaar, as with all the CPS streams, is fished under strict guidelines, barbless hooks are mandatory, as is catch and release fishing. The CPS enforces a strict no take limit, and even injured fish must be returned to the ecosystem. Picnic Beat presents itself as an attractive piece of water with large shallow pools and runs that offer some testy fishing for some of the rivers larger rainbows. The beat is approximately 1km in length and is best fished in the earlier part of the season due to the higher water levels and generally cooler water. 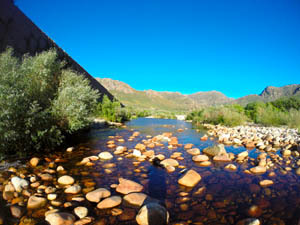 Picnic Beat can be accessed by leaving your car at the confluence of the Klip River and strolling down the road where the start of the beat is accessed via the rainwater channel that joins the river from under the N1. Traveling east from Cape Town, drive 6.7km from the exit of the Huguenot Tunnel on the N1 (2.7km from the Du Kloof Lodge). Park on the right hand side, directly after crossing the Klip river bridge (Figure 1), on the island between the inbound and outbound N1 carriageways. Parking incorrectly can result in a fine. See below for details. Starts at the storm drain inlet 0.9km downstream of the parking (Figure 2). Ends at the inflow of the Klip river into the Smalblaar. The start of the Helderwater Beat will greet you with some lovely dry fly water, where a good number of fish can be caught on most days. This section of river also widens substantially in sections, forming wonderful exposed runs and offers a good selections of trout lies. The shallow water can be comfortably waded for big rainbows. Remember to fish both branches, when the river splits to form an island, even if the pools seem a bit on the small side. Access to this beat is easily gained at the confluence of the Klip river and the beat ends at the weir further upstream. Starts at the inflow of the Klip river into the Smalblaar. Ends at the artificial weir across the river (Figure 2). The pool above the weir is NOT part of the beat. Donkergat is the start of the lower Smalblaar beats and consists of large open runs and several deep pools, some of which are too deep to wade. Dry flies, long leaders and fine tippet are recommended for fishing to the spooky fish in the wide, shallow runs, while indicator nymphing works well in the deeper pools. The weir on the Smalblaar marks the start of Donkergat Beat and it is suggested you park your car there too. Traveling east from Cape Town, drive 5.5km from the exit of the Huguenot Tunnel on the N1 (1.5km from the Du Kloof Lodge). Park on the left hand side in the parking area at the weir visible from the road (Figure 1). Starts at the artificial weir across the river (Figure 2). The water below the weir is not part of the beat. Ends at the top of the rapids before the very large pool with a large boulder on the left. The boulder has a small green fish with a "4" painted on it (Figure 3). The level water before the marked boulder is NOT part of the beat as the beat ends at the top of the rapids. Cathedral Beat water consists of many large pockets with boulders in them. Fish are often found in the slack water around these boulders, or in the tongues of water that exit the pools. A tandem rig consisting of larger dries and small nymphs provides the most productive method for tackling this water. Access to Cathedral Beat can be gained via a small foot path off the N1 down to the start of the beat, about 1.5 km from the hotel parking. 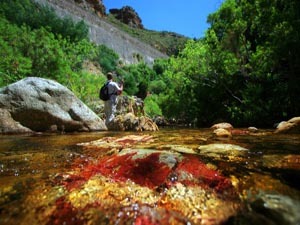 Traveling east from Cape Town, drive 4km from the exit of the Huguenot Tunnel before turning left into Du Kloof Lodge. CPS members must park on the far right through the wooden pole entranceway at the special CPS parking (Figure 1 and Figure 2). Starts at the top of the rapids before the very large pool with a large boulder on the left. The boulder has a small green fish with a "4" painted on it (Figure 5). The rapids downstream of the pool are NOT part of the beat. Ends at the large pool, which is too deep to wade, with a long flat rock face on the left and bushes to the right (Figure 6). The water on Amphitheatre Beat is very similar to that of Cathedral Beat. As with beat 4, access is gained via a small foot path which leads from the N1 down to the start of the beat. This beat finishes at the hotel, which marks the start of the Hotel beat. These two beats are shorter than other beats on the Smalblaar, and are thus can easily be fished in half a day, or both beats can be booked and fished as a single stretch of river. Note both beats can only be booked if each is booked by a different member and then fished together. Starts at the pool where the path joins the river (Figure 4). The downstream half of the pool is NOT part of the beat. Ends 510m from the start, at the large rock in the middle of the river, at the head of the pool that ends nearly in line with the upstream end of the fish farm's fence (Figure 5). The upper stretch of the Smalblaar River is a small stream that carves through steep mountainous terrain. 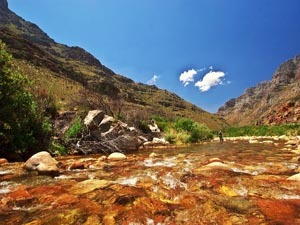 The shaded kloof in the higher reaches provides the trout with cool water throughout summer and, in comparison to the lower beats, such as the Molenaars, the fish do particularly well here in the warmer months. The most attractive feature of this section is the numerous waterfalls and abundant indigenous trees and ferns that adorn the pools. This making Ravens Crag one of th most popular beats in the society. This beat demands a good pair of wading boots and warm clothing for the early morning and late afternoon. At one point, the only way forward is through a narrow gorge with steep cliff faces. The tiny Krom river joins the Smalblaar roughly half way up Ravens Crag Beat. 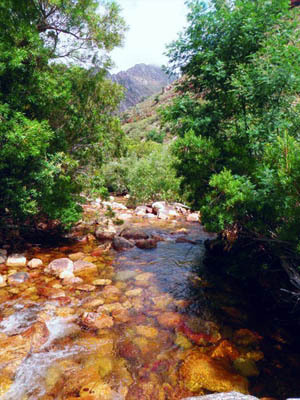 This little stream holds sparse populations of rainbows, whose size is sure to impress you. Fish of 15 inches have been seen feasting in the tiny, shallow pools along this stream. Parking for Beat 6 is at the Huguenot Tunnel, and the beat starts at the low water bridge just down from the parking area. Fish upstream towards the confluence of the Elandspad and continue up the right branch until you reach a large impassable waterfall. Beat 6 is often only fished up to the confluence of the Krom, as above this point the beat becomes a lot more technical. 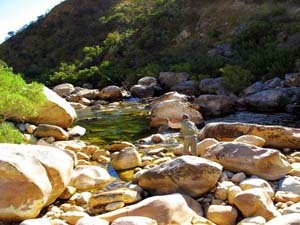 With the river narrowing into a gorge and the dense Rooi Els trees hanging over the edge of the stream, casting becomes trickier. Either way a good number of fish can be caught on this beat, even if you only fish half of it. Traveling east from Cape Town, 250m from the exit of the Huguenot Tunnel, pass under a large bridge over the N1 then turn right into the small side road as the N1 splits to two lanes (Figure 1). The side road terminates at the parking area near the weigh-bridge. Starts at the concrete low-bridge across the river (Figure 3). The water downstream of the bridge is not part of the beat. Ends approximately 1.16km from the start, approximately 280m after the confluence with the Krom River at an impassable pool. The end GPS co-ordinates of the beat have not been recorded. Hotel beat offers fisherman some of the best glides and runs on the Smalblaar. The beat flows at an almost constant width and offers spectacular fishing. Fish are always plentiful along this stretch of river and the water is almost always crystal clear. This beat is well rounded, offering the wider, shallow nature of the lower beats with the cooler water of the upper beats. Hotel beat also fishes well in higher water when some of the other beats are unfishable. Access to the beat is easily obtained from the hotel property and once you are done fishing you can simply follow the river back down to the hotel. Starts at the large rock in the middle of the river at the head of the pool that ends roughtly in line with the upstream end of the fish farm's fence (Figure 4). At the sign (private water) up the bank on the road side (left) of the river (Figure 6). The end is NOT where the road bridges across the river (400m upstream). Starts in line with the downstream end of the retaining wall along the N1 (Figure 3). Only the head of the pool here is part of the beat. Ends 1.24km from the start, at the concrete low-bridge across the river (Figure 4). The pool upstream of the bridge is not part of the beat.